There are many useful facts that can help improve your cooking. For example, cutting a steak against the grain will make the meat more tender. Searing meat will help boost the flavour, though it does not lock in the juices. Storing a sliced tomato upside down will help keep it fresh for longer, and putting fruit in a paper bag will help with the ripening process. Many people use different wines in making a sauce, rum in baked goods, et cetera. This adds more flavour and different layers to cooking. Most people do not think twice about it, since they believe the cooking process will make the alcohol content evaporate, only leaving the flavour infused in their dish. However, science indicates this may not actually be true. 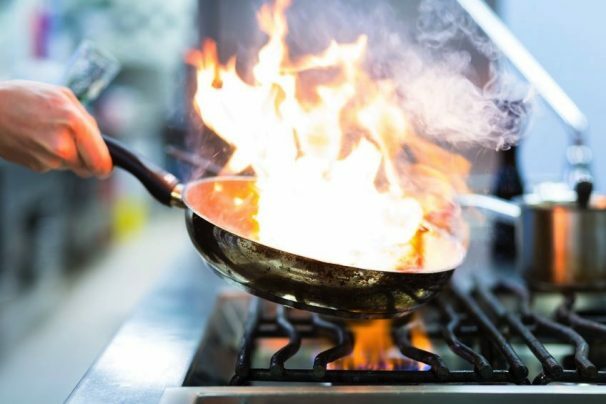 Depending on the specific cooking technique, including the length of cooking and the temperature, you may have up to 85% of the alcohol still in your food! Those who are spice-conscious but still want to include peppers in their cooking often remove the inner seeds in an effort to minimize the heat in their dish. However, this is not effective, since the seeds in peppers actually do not contain the most heat. In fact, the vast majority of the heat comes from the pith and ribs of the pepper! Thus, you would actually want to remove most or all the pith and ribs if you need to tone down the power of the peppers in a particular dish. Leaving the seeds behind is perfectly fine. No one wants their pasta to stick together—this just results in clumpy bits and broken noodles. It can also mean chewy pasta. To combat this, many people put a little bit of oil, most often vegetable or olive oil, to their pots of boiling water in an effort to prevent the pasta noodles from sticking. However, this does nothing for you. Not only does oil just float to the top, it can also affect the amount of sauce that can stick to your noodles, which some believe makes it a complete waste. The only ways to really ensure your noodles do not stick is to stir the water when it is at a full boil. Does anyone really want to wait that long for their water to boil? No one we have heard of, at least. Many people look for tips to make the water boil faster, including salting their water. However, salt has a higher boiling point than water, which means it can actually slow down the boiling process slightly. The real reason to add salt to your pasta water is for seasoning. The only way to ensure your water boils as fast as possible is to turn up the heat and keep the pot of water covered. Microwaves are perhaps the most convenient appliance an individual can own when it comes to cooking. Many people often find themselves relying almost entirely on their microwave, trusting that its ability will kill all bacteria present on their food. However, this is not true. Microwaves heat from the outside in, which is part of the reason you may end up with cold spots. These, as you may or may not be aware, are breeding grounds for bacteria. In fact, some studies have linked this to cases of food poisoning. Thus, while microwaves are good for reheating fully-cooked meals, they are still not the safest way to cook your meals. If you’re worried about bacteria, you would be better off using other appliances, such as your traditional oven.